On one of my trips to Lake Superior I came across a Cairn someone had built a few feet out into the lake. Even though it was early morning when I made this discovery there was no mist. I could envision what this cairn would have looked like at sunrise with early morning mist rising from the water. Here is a painting of that vision. 48X24 oil painting on gallery wrap canvas, ready to hang. Signed on the front and with a signed birth certificate. “Cairns, Stones and Rocks", in the form of still-lifes, and rock-strewn landscapes is my most recent series of paintings. The inspiration to work with rocks comes from visits to the Lake Superior North Shore in Minnesota and a western trip to Utah’s and Arizona’s Red Rock country where I would come across these beautiful “Cairns”, rocks stacked on top of each other, created and left behind by other creative rock lovers. 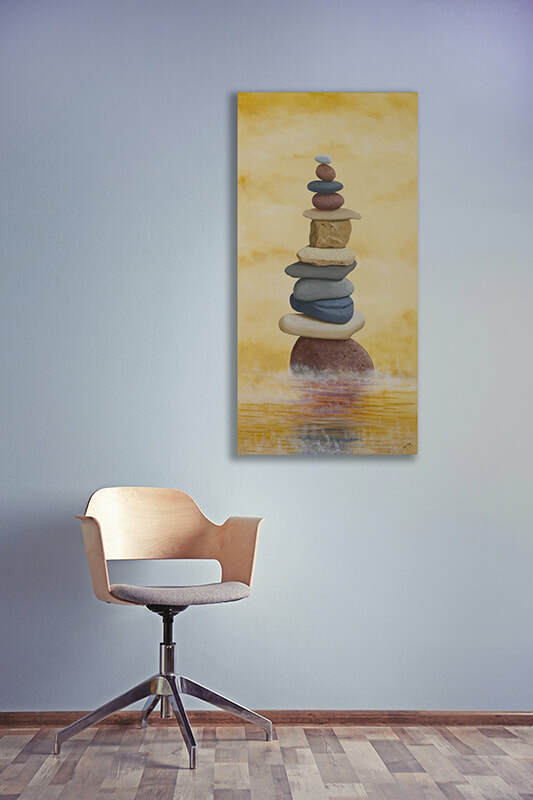 I like to think many of my cairn paintings as collaborations with strangers I’ve never met.